Everything rises and falls on followership. Shaving is one of the finest pleasures in personal grooming. Shaving weds modern expectations and convenience with primitive impulses to conquer the wild. Shaving is a repentance of sorts; it is the life cycle in microcosm—from the innocence of smoothness come uninvited sprouts which arrive in earnest only to grow long, fall down, and tangle in random squiggles. Shaving is a chance to start again, to go back to smoothness. And how much more manly and adventuresome can one be than to scrape his face with a razor, and this most often in a backwards reflection of a mirror? It could be argued that this takes much more bravery and skill than shaving other parts of the body, like the legs or pits. As in everything else a man does, good equipment is essential. A dull blade that snags on every whisker, and then proceeds to jerk it out, is loathsome. Of course, many prefer electric shavers. This is the treachery of modernity, along the lines of taking NoDoz in lieu of drinking a cup of strong, black coffee. Pragmatism often robs us of the simple joys in life. Joy cannot be rushed, and it should not be rushed for mere convenience. But aside from the lost joy, electric shavers always have the smell of burned whiskers, and they sling stubble dust into the air. But this treatise is not about electric shavers. I don’t like shaving gel. Gel is cowardly. Gel hides in its can and must be forcefully driven out. Once outside the can, gel shrivels up in the palm of your hand like a withering plant in the desert sun. Like a scolded dog it hunkers down in a little heap. I am never sure how much gel to use. I get way too much or not enough. And trying to put it on is impossible. The clump easily rolls out of your hand and into the sink. When you try to rub it on, it slithers away into the cracks between your fingers. Shaving gel is not cream—or else it would be shaving cream—but must be persuaded to become shaving cream. Shaving gel must be worked into a lather. It must be rubbed and caressed and stroked and cajoled until it finally—reluctantly—turns into something partway useful. And even then it is a rather medium-textured, flat foam of questionable use, still wanting to be the gel from which it was coaxed. Cream is different. Ah, beloved shaving cream, thou plump and glorious lather! Never timid, never shy, shaving cream looks for every opportunity to escape the can. It explodes onto the scene ready and willing to do its job. Unlike the shrinking, wobbly gel, shaving cream wants to get out of the can. It is entrepreneurial, aggressive, and anxious. Everything about it says, “Use me! Use me!” Its rich thickness will never fall off your hand only to be lost down the drain. No, a good shaving cream is dense, thick, puffy. It is full-bodied. Gels come in exotic scents, but shaving cream smells like shaving cream, not hibiscus or tea tree or eucalyptus. Gels come in colors, but shaving cream is white like snow. Gels are doctored up with scents and spices and specks and flakes and whatever else is popular, but shaving cream has always been and always will be thick, foamy, and white, and it will always smell the same—clean. The wonder of shaving cream is that it is cream. It is plump. It is firm. It is smooth. Every little boy wants to play with shaving cream. Hardly anyone finds pleasure in jelly, except it be on toast. No one ever has a shaving gel fight. Gel was not formulated in response to whiskers. Gel was formulated for men who were bored with being manly. Blast you, gel! Imposter. © Rodney Shaw and rodneyshaw.wordpress.com 2009. Unauthorized use and/or duplication of this material without express and written permission from this blog’s author and/or owner is strictly prohibited. Excerpts and links may be used, provided that full and clear credit is given to Rodney Shaw and rodneyshaw.wordpress.com with appropriate and specific direction to the original content. I’ve used an electric shaver for a long time now. I repent! Shaving cream, I embrace you! 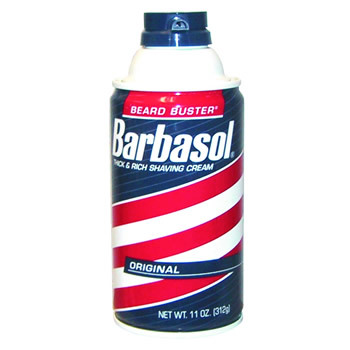 I concur with your literal accuracy in description of Sir Barbasol. We salute you in your uncompromising and eloquent defense of the white puffy stuff, and quite frankly, thoroughly enjoyed the lighthearted comical relief. © Rodney Shaw and rodneyshaw.wordpress.com, 2009. Unauthorized use and/or duplication of this material without express and written permission from this blog’s author and/or owner is strictly prohibited. Excerpts and links may be used, provided that full and clear credit is given to Rodney Shaw and rodneyshaw.wordpress.com with appropriate and specific direction to the original content.